Type 5 Disc Brake - we are proud to add a disc brake option to the premier Crumpton Type 5 frame. We chose to utilize the flat-mount and 12x142 through axle standards for maximum stiffness and alignment where performance is as keen as their tidy appearance. As with all Crumpton Type 5s, the chainstays and dropouts are molded in house. The Type 5 disc is designed to accommodate a 35mm+ tire while maintaining minimum chainstay length with standard full sized 53x39 road gearing. 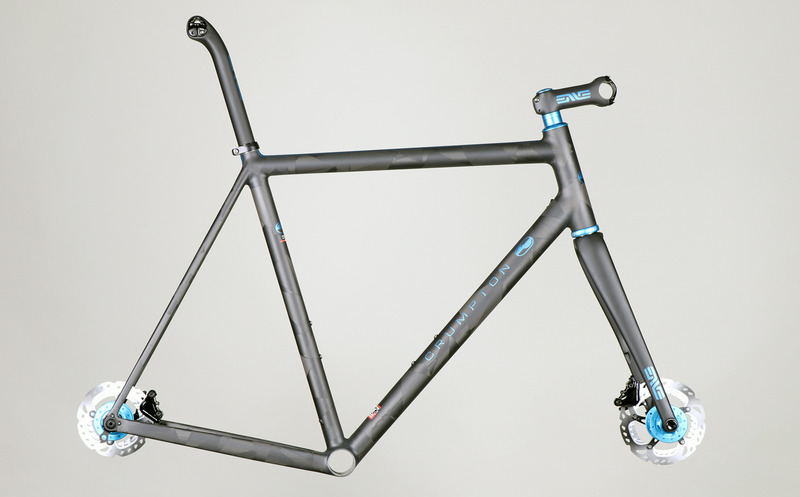 The Type 5 disc frame is delivered with full internal routing of either hydraulic or mechanical brake lines from front to back. Combine with electronic internal wiring or wireless shifting for a super clean appearance. The Type 5 disc option can be configured with a standard disc road fork or larger clearance gravel road fork. Winner of Best Carbon Layup at NAHBS 2018. Type 5 Disc with Di2 internal wiring, Hydraulic Discs. Enve cockpit. Graphics to match Chris King hubs and headset.